A lot of people want to know if they can use SOLIDWORKS PDM to manage revisions in SOLIDWORKS Electrical. There are a couple ways that you can manage your electrical data in PDM. 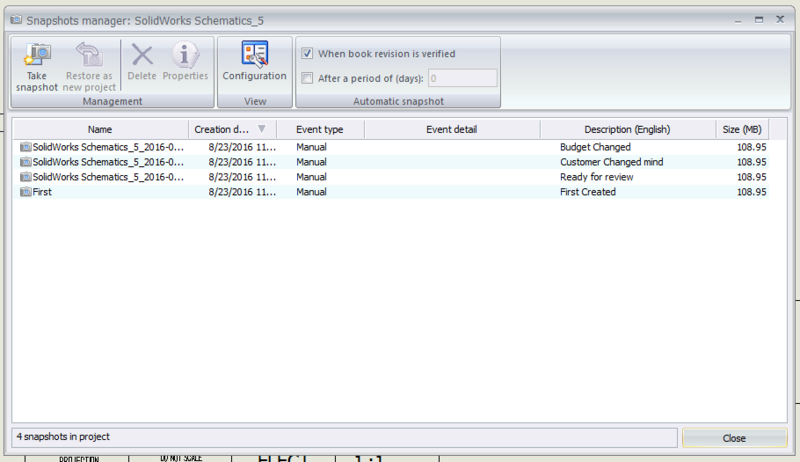 The most common methods are to check-in the project archives when complete or to check-in the output PDFs when complete. However, today I’d like to focus on the built-in revision control inside of SOLIDWORKS Electrical. You’re going to want the revision notes to be a part of the title block on the cover page and individual drawings, so it has the capability to annotate who drew, approved and validated each revision. This can be done at the project level or at an individual page level. For the project level revisions, right click on the book and select “revision control.” This will open up a dialogue for you to Verify, Validate and input any descriptions for the changes that were made. You can also input user variables, such as an ECN (engineering change notice) number, if you desire. When you finalize the revision it will prompt you to ask if it should apply that revision to all of the documents in the project as well. If you wanted to revise only an individual page in the project, rather than the whole project itself, you would go through the same process, only instead of right clicking on the book, you will right click on the page in question. It’s important to make sure that you have the right attributes on your title block. Revisions at the project level write to different variables than the document level. So if you individually revise a page in the project, but your title block on that page has the project revision attribute, it will still show the previous rev number/letter. I recommend using project revision attributes on the cover page, and document revision attributes on the other pages’ title blocks. When you revise the project and push it to the other documents everything will be up to date. This is all geared towards release revisions rather than engineering revisions, although you could use it for that. In 2016 SOLIDWORKS introduced the snapshot feature which works great for engineering revisions as you are moving along in the project. Periodically, as you’re working, take a snapshot and this will create a project archive that is linked to the project. If you ever find you need to roll back, you can go into the snapshot manager, and it will create a duplicate project at that revision level (this prevents someone from rolling back and accidentally erasing all of someone else’s hard work). The snapshot manager is also where you can set it to prompt you every few days to take a new snapshot. Of course, I know that everyone who has PDM will still want to manage revisions that way, so you will want to export the documents you’d like and create create a project archive to check into PDM. Brian Cooke is a Certified SOLIDWORKS Electrical Specialist and Electrical Application Engineer at 3DVision Technologies, a SOLIDWORKS Value Added Reseller with locations throughout Ohio, Kentucky, and Indiana. He is a regular contributor to the 3DVision Blog. Founded in 1995 in Cincinnati, Ohio 3DVision Technologies Corp. has enjoyed over 18 years of success as one of the finest SolidWorks providers in the Great Lakes Region. 3DVision Technologies is a team of experienced mechanical engineers that support the visions of engineers globally. With solutions for the design and manufacturing industries including 3D solid-modeling, computer aided analysis, product data management and 3D Printers our products solve engineers' most important product development goals: higher quality products, less time to market, lower development costs, better design communication, collaboration and review.